If it is not active, the hypervisor shell is kicked to handle inputs from the physical UART, if there are any. If the vUART is active, the bytes from the physical UART are redirected to the RX fifo of the vUART, and those in the vUART TX fifo to the physical UART. The console is only available in the debug version of the hypervisor, configured at compile time. In the release version, the console is disabled and the physical UART is not used by the hypervisor or SOS. For debugging, the hypervisor shell provides commands to list some internal states and statistics of the hypervisor. It is accessible on the physical UART only when the vUART is deactivated. See ACRN Shell Commands for the list of available hypervisor shell commands. The vUART is exposed via I/O port 0x3f8. Incorporate a 256-byte RX buffer and 65536 TX buffer. Full emulation of input/output bytes and related interrupts. For other read-write registers the value is stored without effects and reads get the latest stored value. For read-only registers writes are ignored. vUART activation via shell command and deactivate via hotkey. The following diagram shows the activation state transition of vUART. After initialization vUART is disabled. 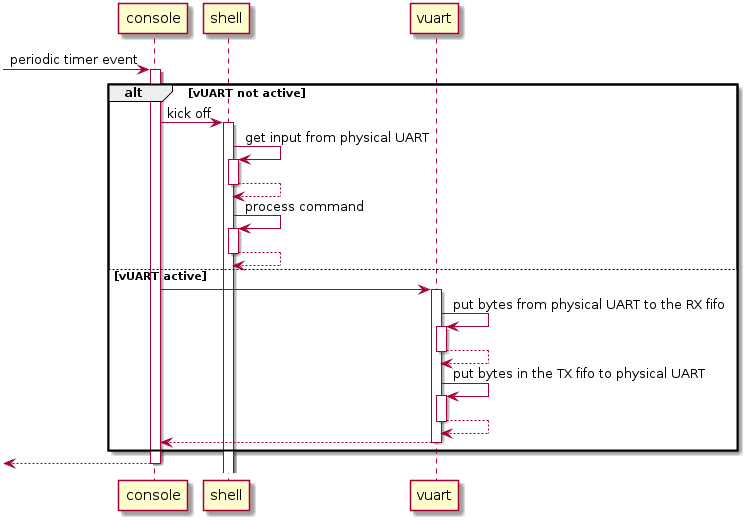 The vUART is activated after the command “vm_console” is executed on the hypervisor shell. Inputs to the physical UART will be redirected to the vUART starting from the next timer event. The vUART is deactivated after a Ctrl + Space hotkey is received from the physical UART. Inputs to the physical UART will be handled by the hypervisor shell starting from the next timer event.